Volkswagen being a German giant has always manufactured performer cars. If it’s a Volkswagen, then it will create a lot of enthusiasm at the driver’s end. In the current competitive market, Volkswagen has introduced mouth watering offer over the Polo and the Vento. The offer has made these cars even affordable. The 0% interest rate sounds very pleasing, and if this rate get reflected over a Volkswagen than it became icing on the cake. 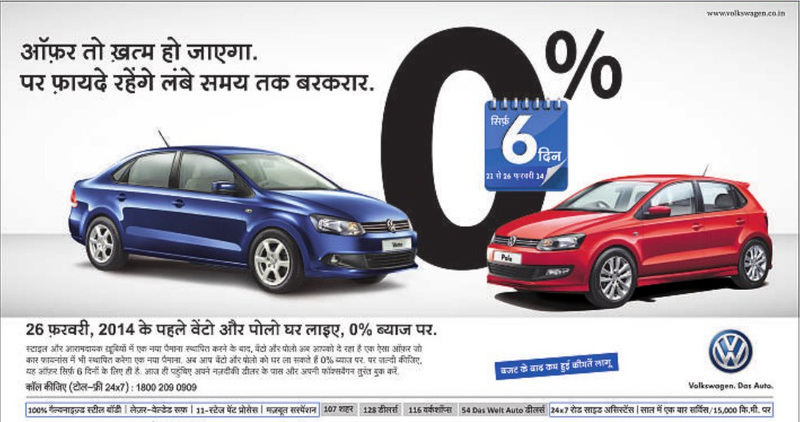 Volkswagen has announced 0% interest rate on its Polo and Vento cars. This offer will be valid upto 26th February 2014. The rebate announced in the 2014 budget will be applicable over these cars. Volkswagen cars are equipped with highly 100% galvanized body, laser welded roof, 11 stage paint process, solid suspension, steering mounted controls, music player with navigation etc. Volkswagen has 128 dealers and 105 workshops across 107 cities.